The Fender Telecaster is high on the list of best guitars for country music. If you are a guitarist who plays country music, how do you decide which guitar is best for you? You want a guitar with great tone, one that you can rely on through years of practice, rehearsals and gigs. There are some big names that come to mind when trying to think up the perfect guitar for country, but there are also a few options out there that may surprise you, especially if you’re looking to save a dollar or two. I think you can break the ideal country sound into two types. There is the traditional country twang, more indicative of classic country but still used today by a whole lot of guitarists. For this sound guitarists want to choose bright guitars made of tonewoods like alder. Single-coil pickups will get you the twangy and clucky sounds you are looking for. Then there is the smooth, overdriven sound of southern rock, and for that you want a guitar that utilizes a warm tonewood like mahogany in its construction. Here you want to look for vintage-style humbuckers. No matter which direction you go, the same universal truth applies in country as in every genre: Great guitar players make guitars sound great. Find an instrument you love and stick with it, and soon enough you’ll find your sound. Here are a few suggestions. Any guitarists serous about country music should at least check out the Fender Telecaster. This is the icon guitar of the country music world, used by musicians going all the way back to its creation in the 1950s. In my opinion, the Telecaster is your best option as a country guitar player. In fact, in the poll at the bottom of this page over 70% of readers chose the Tele as their top choice, so I guess I'm not alone! 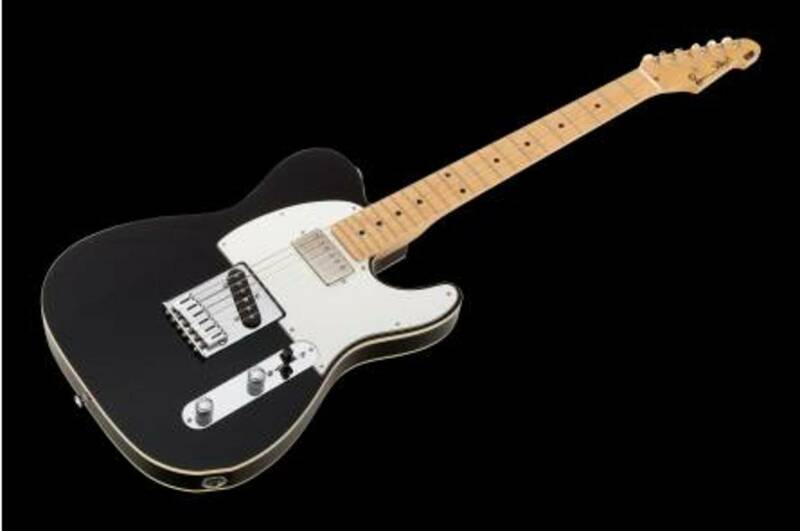 The Fender American Standard Telecaster is available with an either ash or alder body, and has two Fender single coil pickups, a maple neck with a rosewood or maple fingerboard, and a fixed bridge. It’s about as simple as a guitar can get, but the Telecaster tone is legendary. With only two pickups you have three pickups configurations to choose from: Bridge, neck or both. The neck pickup is a bit glassy and perfect for playing clean or for bluesy soloing with a touch of overdrive. Both pickups together will give you that vintage rock sound, very usable in a country setting. The bridge pickup sound is brighter, and this is where you’ll get the country twang you’re looking for. 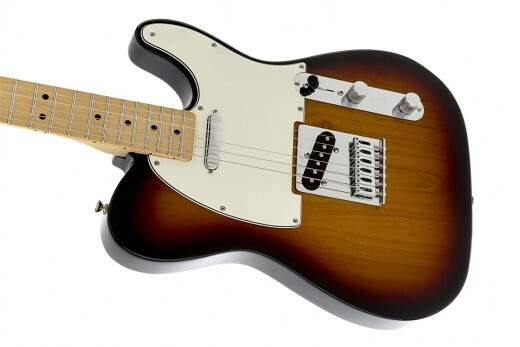 Some Teles are hot-rodded or feature specialized components to help you create a unique sound. For example, the Deluxe Nashville Telecaster has a middle pickup like a Stratocaster, allowing you more sound possibilities than a traditional Tele. The Telecaster is definitely in the traditional country guitar camp, and the Tele sound is almost synonymous with country music. However, the guitar is also versatile enough to let you dabble in blues and jazz without missing a beat. Even hard rock players have used the Telecaster over the years, usually with a humbucker in the bridge position. 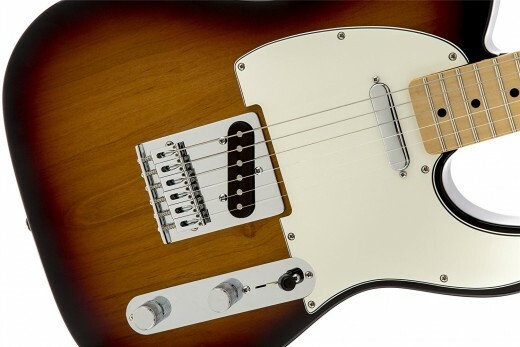 If the American Telecaster is a bit too expensive, check out the Fender Standard Telecaster, a version of the Tele made in Mexico with slightly downgraded components. It’s still a Fender, and MIM guitars can be outstanding instruments even for professional musicians. The Fender American Strat is another great option for the traditional country sound. 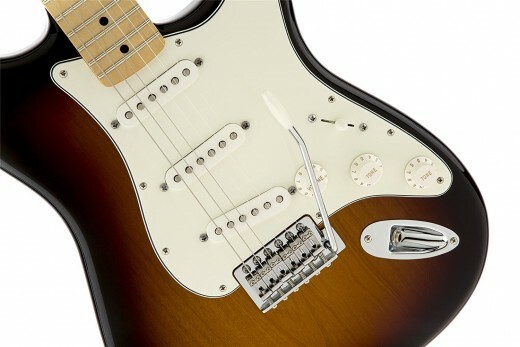 Like the Tele, the Stratocaster has an alder body with a maple neck and either a maple or rosewood fingerboard. This combination makes for the snappy tone most traditional country players are looking for. On both the Stat and Tele the one-piece maple beck option will get you a brighter tone, where the rosewood fretboard will mellow things out a bit. With three single-coil pickups and five pickup combinations the Stratocaster is versatile guitar that has made its mark in just about every genre of music. 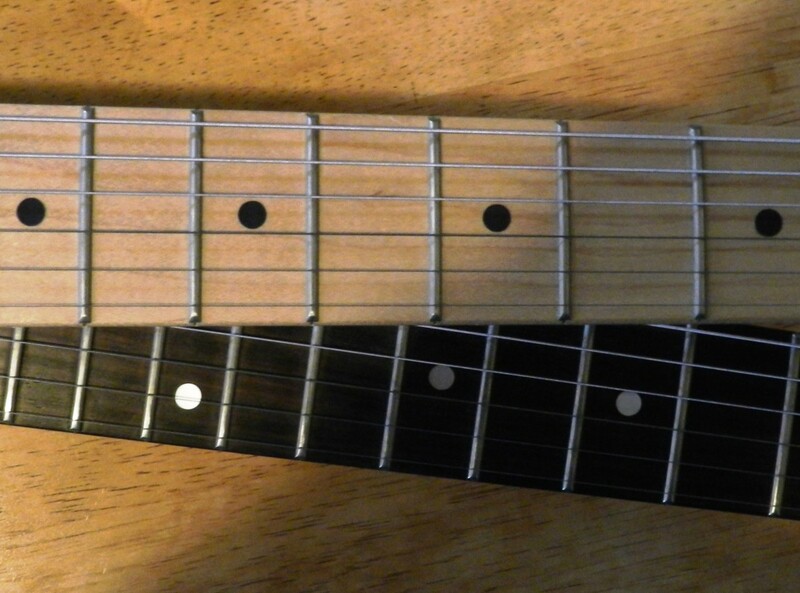 Of course it is well known in rock and blues, but the country player can get a lot out of the Strat as well. Pickup selector positions 2, 3 and 4 in particular lend to some great country sounds, from twangy to chicken-pickin. The neck pickup is smooth and rounded and sounds great with clean sounds and open chords. And, of course, the Strat shines when you add a little overdrive. There’s a too, and it’s a lot easier on your wallet. Both the American and MIM versions are available with humbuckers in the bridge positions (HSS). This configuration will set you up a better if you are looking for a country rock sound, and a hotter pickup will push your amp harder. Also note: Musicians who want a real American-made Fender Strat or Tele without the steep price tag ought to check out the American Special Series. 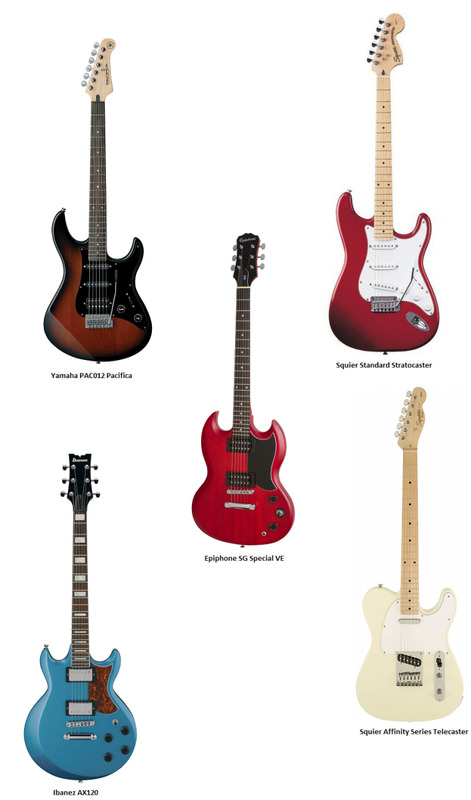 These are guitars made the USA with different features than the American Standard Series. Like the Stratocaster, the Les Paul has triumphed in every genre of music. Why should country be any different? But the Les Paul is a different kind of guitar. Here we’re getting into more of the country rock sound, made big by bands like Lynyrd Skynyrd and The Allman Brothers. Today, many country bands draw influence from this style of music, and some of the best country guitar tones come from a combination of smooth overdrive and Les Paul guitars. Unlike the Strat and the Tele, the Les Paul is not a bright guitar. With a mahogany body and neck, it has a deep resonance and great sustain. Pair it with a Marshall or Fender tube amp and it's tone nirvana. The bridge pickup on the Gibson Les Paul will give you that crunchy rhythm sounds you’re looking for in your chords, while the neck pickup is bassy and great for clean sounds or lead playing. Both pickups together make for a great jazz tone, warm but with just a little bite. If you can’t manage the cash to spring for Gibson, you can look to Epiphone, a company owned by Gibson which builds Les Pauls to Gibson specs. Epiphone Les Pauls are built overseas with downgraded components from their big brother Gibsons, but they are still great guitars for the money. In fact, if you play in some rough clubs you may prefer to bring your Epi to the show rather than an expensive Gibson. The Epi Les Paul might be a fraction of the cost, but like the Gibson they’ll get your that warm, resonant Les Paul tone. The three guitars listed above are pretty much no-brainers when it comes to guitars for country. But what about some other options for guitarists who like to march to a different drummer, go off the beaten path, take the road less traveled, or adhere to any number of other clichés? Ibanez AR Series: An Ibanez for country music? 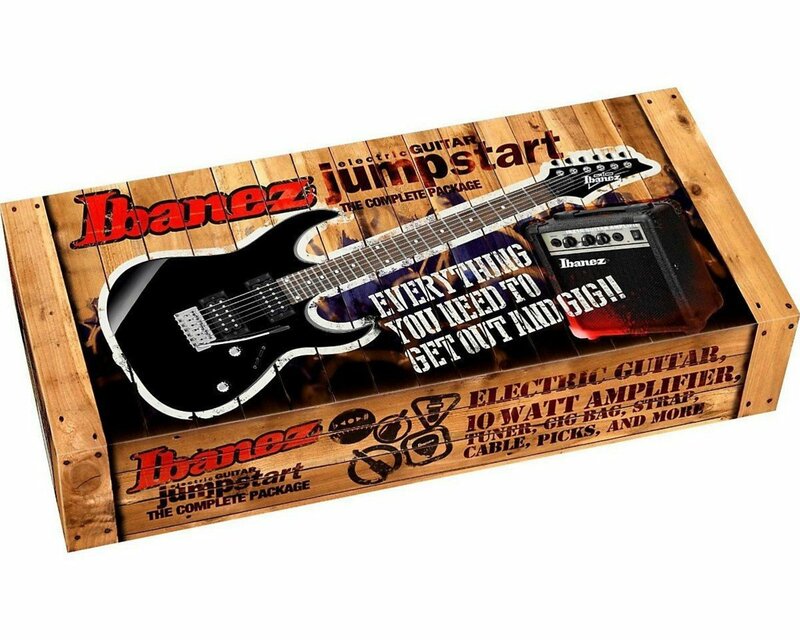 Ibanez guitars are known as great metal guitars, but before the RG and S series instruments took off in popularity there was the AR. Ibanez describes the guitar as classic, warm and versatile, and if you are looking for an option to fit those standards that doesn’t say Gibson on the headstock the AR might be the guitar for you. G&L Guitars: G&L is a guitar company Leo Fender helped start back in 1970s. Leo Fender, if you don’t already know, is also the guy responsible for Fender guitars. That should tell you a little something about G&L design and quality. There are instruments simlar to Telecasters and Stratocasters in their lineup, and some that take those designs quite a bit further. PRS Custom 24: PRS Guitars are some of the best in the industry, and the SE line is very affordable. The Custom 24 is built with a mahogany body and maple top, with a maple neck and rosewood fingerboard. This is a great-looking guitar that will put out some incredible tone. Carvin Guitars: Carvin makes custom guitars and basses, and no matter what kind of tone or configuration you are looking for you can probably put together a guitar that meets your needs. You start with a basic body style, and add your choice of pickups, tonewoods, hardware and other materals. Definitely worth checking out. Fender Telecaster: Best Guitar for Country! If you play a bunch of guitars, eventually you’ll find one that just seems right. Whether you are looking for the traditional country sounds, or the southern-rock tone, with a little patience you can find the right guitar for your needs and budget. The Telecaster, Stratocaster and Les Paul are great choices, whether you go with the standard Fender and Gibson models, or choose the more budget-friendly MIM and Epiphone versions. The Telecaster has that twangy country vibe, and many guitar players swear by it for their sound. The Stratocaster has a tone all its own, that will take you from classic country to modern country rock with the flip of the 5-way switch. The Les Paul nails that thick southern rock sound, and many guitar players rely on it for traditional country as well. But you may want to dig a little deeper in your search, and see if you can find a unique guitar from a lesser-known manufacturer. There is no wrong answer. Keep on playing until you find your sound. Good luck in your search for the best guitar for country music. 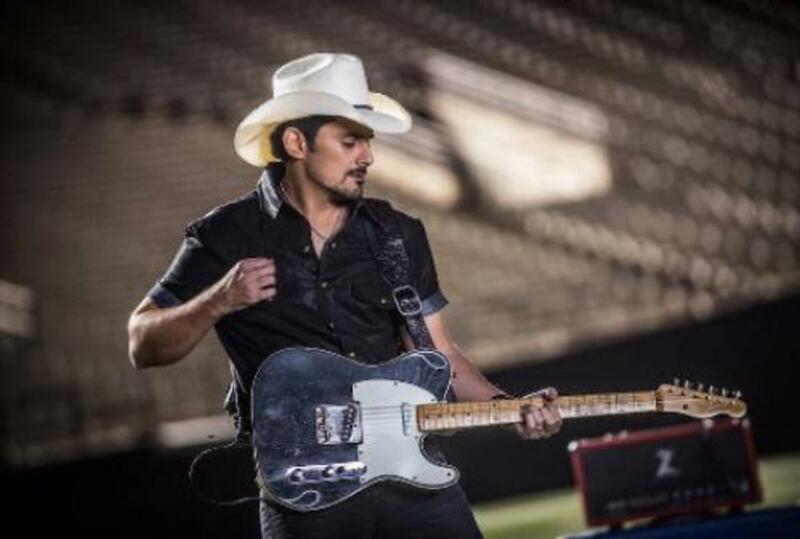 Which guitar is best for country music? I used a black 57 avri strat in a country band for a long time,mostly the middle pickup that everybody seems to hate. I have tele's and strats and Nashville teles. its all good because its not the guitar as much as it is the player of the guitar. sometimes pro's can't be picky, Jimi and quite a few others couldn't afford the latest greatest guitar but made use of what they had. we need to play more and worry less about what the guitar market is doing. Hi James. I've never compared them side by side. I'd expect the Gibson to be a little warmer, but in the same neighborhood. Jerry (I like Gretsch guitars for there unusual tone which I don't think can be immitated. Gretsch guitars are good for Country sound. I have owned two. One 1957 Nashville and now have a reproduction in a new model. However I can't short change compliments on either guitars mentioned above Strat-or-Tele. I have used a custom Shop Strat for the last 20 years for country style lead guitar. It's been great. Lots of compliments on the sound. I recently purchased aTelecaster Elite Series. Gigged it four times and I would say this guitar is very easy, comfortable to play and sounds really good with Country material. The bass notes stand out somewhat better than the Strat. And the Strat in my opinion is very hard to beat for both playability and sound.